Beautiful gulf views from this large 4 bedroom, 3 bath beach home with private pool. Highly rated, 4.9 out of 5 average with 21 Reviews and growing. Children friendly ( high chair, booster seat, gates and port-a crib in home) and Pet friendly (one small dog). Only 75 yard walk to the beautiful gulf beach. 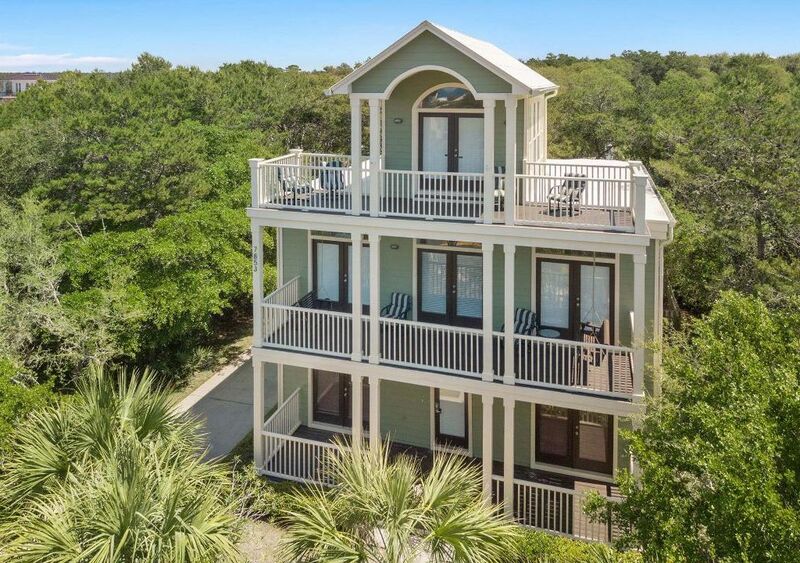 Incredible gulf views await you from this three-story home sitting across from the Gulf in Seacrest Beach. Recently redecorated. Spaciously designed with four bedrooms, great room and a tower room to comfortably accommodate your group. You will find the master suite with king bed and private bath with Jacuzzi, plus two guest rooms; one with a king bed and the other with two twin beds that share a Jack and Jill bathroom on the first floor. The second floor includes the living/dining area with access to a large covered balcony, an adjoining eat in kitchen plus a guest room with a queen bed and full bath. Spectacular sunrises/sunsets and emerald green waters are so impressive from the third floor tower room with its open covered balcony and wall of windows. A great area to relax with a wet bar and sitting area, can also provide additional sleeping space with its queen sofa bed. After a day at the beach, enjoy the private pool completely fenced for your privacy and security. Saturday to Saturday weekly rental. This is a picture of our three children taken from the 3rd floor balcony at sunset during Thanksgiving. Michele and I live in Atlanta. We have always loved the beach and the Gulf area and finally got around to purchasing our home last spring. We love being at 'Seascape' and believe you will too!! We purchased in Seacrest Beach for several reasons; beautiful beach/water, closeness to Atlanta, many friends live in the area and you can enjoy your privacy or you are a short distance to all the shopping and restaurant activities. We are a short walk to the beach and have a private pool that is fenced if you want to relax close to home. We enjoy the spectacular views, sunrises and sunsets over the gulf from the 2nd and 3rd floor balconies. Located half way between Seaside and Rosemary Beach, just a few minute car ride to the shops and restaurants of either fun location. 1 Land Line phone in kitchen. My Family had a great week on 30A. We enjoyed the views/sunsets on the third floor balcony, walking to the beach, swimming in the private pool in the fenced in backyard, short rides to the shops and restaurants . We also found a seafood store and cooked dinner in the well provisioned kitchen. I am so glad that you and your Family enjoyed our Beach Home, Seascape. Please tell your friends and come again!! Property is a in a great location is nicely decorated. Thank you JL and very glad you and your Family enjoyed your stay at our home, Seascape!! Pictures online were great, and the house was in a desirable location. The house is very dated and needs a few furniture upgrades. For example, the master bedroom mattress has two distinct waves in it from overuse and the couches look very worn out. Hot tub does not function. To advertise as a luxury accommodation and get low quality sleeping arrangement was disappointing. The owner was very responsive and helpful on all situations (5 stars), but in my opinion the management company was not worthy of the owners trust. The keyless entry on the home failed, I called the management company only to be blown off for an hour and half. When I called back their option was to wait overnight with the low battery alarm going off. Which was right next to our bedrooms. This was not an option for me, and they finally agreed to send out a locksmith to remove battery and then another one the next day to replace the entire keyless entry lock. This whole process could have been handle faster in my opinion had they taken my original call serious. This area is secluded and driving 30+ minutes to everything is common. At the moment of our stay there was a lot of construction in front of the home, which made getting into and out of the small driveway hard at times with traffic and construction equipment. There is also a street sewer pump in the lot next to the home, which leaves a less than desirable smell during higher temperatures. We were glad the temperature was somewhat cold during our stay. I apologize for your issue with the keyless entry and have spoke with our management company. Most people enjoy our location as we are not in the middle of the hustle and bustle of Destin or Panama City Beach, as well as only being 10 minutes for the shops and restaurants of Rosemary Beach. Have not heard a complaint before about our furniture/beds, but will take a look at them when we are down in a few weeks. I also have never gotten a complaint in 10 years about the pump on the corner of the next lot and will call the water company. We have over 20 reviews with a 4.9 out of 5 average. Sorry you did not have the same experience as most of our guests. Great location -beautiful home-we had a great week. House is great has everything you could possibly need. Close to beach and you have your own pool. We enjoyed both. Rose bikes to Alys & Rosemary beach which are just down tge street. Thanks Shan and we are so glad that you and your friends had a great time at Seascape. Please tell your friends and come back again! PROS: House was clean overall, had good variety of cookware, washer/dryer, comfortable beds, spacious kitchen & dinning, sufficient hot water for 3 busy bathrooms/showers, clean comfy outdoor furniture, no roaches, and privacy around pool. Residential area so more quiet and less traffic and activity than Destin. Ally & Rosemary beach are a short drive away with neat shopping district, and beautiful houses and landscaping to sightsee. Pool provided a nice break from the beach. CONS: Stairs - kitchen & living room on second floor so lots of going up and down which might be hard on some (elderly, handicapped, toddlers); my knees/calves ached by the 3rd day as did others but we adjusted and my dad (68) did fine. It was a long walk to beach, more than 75 yards, then plenty of stairs once you get to access point so difficult to pull a loaded wagon with beach gear. Some people parked in grass by bicycle lane but we feared getting towed, also road running in front of house is very busy and around a curve. Few minor things need upkeep. Ceiling fans in 3 of bedrooms rattled and clanked so much we turned off or set on low; this affected our sleep the first night. The fans simply need to be resecured and tightened up. Toilet ran in 2nd fl bathroom but a repair man promptly came when we called. There are enough bath rags/towels for 1 person each so bring more if you don’t want to wash daily. The only indoor access to the pool is through a bedroom or outdoor by walking around to back of house, so we invaded my dad’s room daily. My sister’s bed had sand and “man hair” (sisters wording lol) in it, so we all questioned the cleanliness of our beds but didn’t notice anything. Very residential area, not like Destin, so all small local restaurants & grocery stores stay packed & prices high, and gas stations are a drive down the road. Pool pump & skimmer needs attention and net needs to be replaced; it has lots of rips and not useful in cleaning out leaves, bugs. Hi Daniel and thank you for the four star review! I apologize that there were issues with our home and glad that the toilet was taken care of quickly. I have a pool service that comes once a week and will take up your comments with them. I will take care of the other issues myself as we are here this week. Our housekeeping service always does a great job and I have never had a complaint about cleanliness or the amount of bath towels provided. Of the 100 have or so Families that have rented our home over that past 10 years have done so mostly because the like the privacy of the home, shopping and restaurants on 30A and do not want the hustle, bustle and traffic in Destin. Thanks so much for the wonderful review and very happy you enjoyed your stay at "Seascape"!! Beautiful views from the balconies of the Gulf, Lake, Sunrise and Sunset. Short walk to the beautiful beaches. Very private. 10 minute drive to either Seaside or Rosemary Beach attractions.